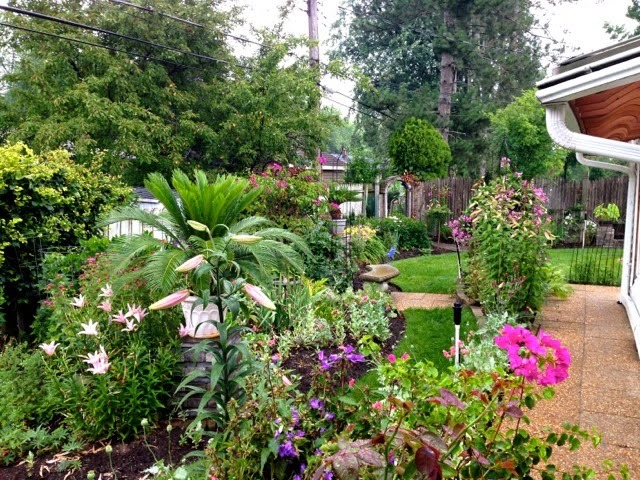 One of the things I like most about being the area's chronicler of residential gardens, is that I still get astounded, in slacked-jawed awe, of a new spectacular garden that I never knew existed in our area. Such is the case of going on the Snyder Clevehill Garden View tour a couple weeks ago. 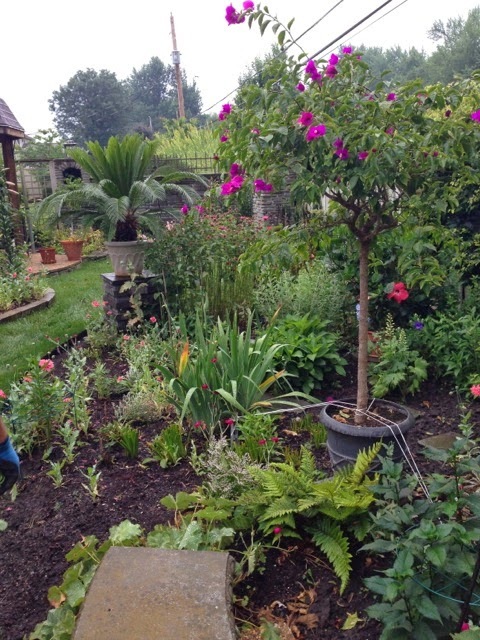 I came across the garden of Peter BonSey, a genuine TV show gardener. 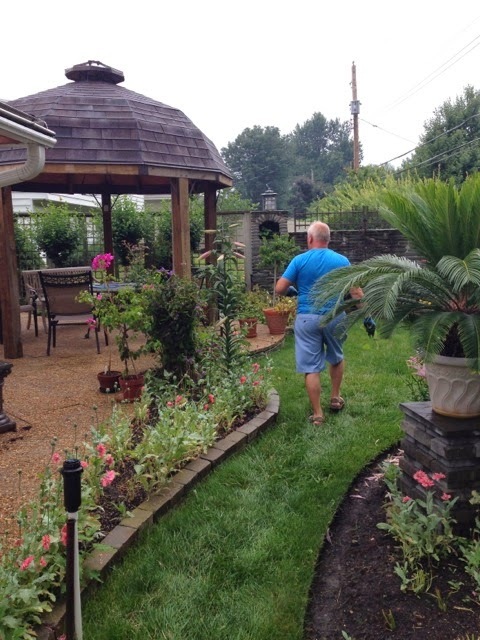 Peter was the garden designer on TLC's season 1 (2002-03) of While You Were Out, a reality series makeover show whose gimmick was that the redecoration was kept secret from the homeowner. 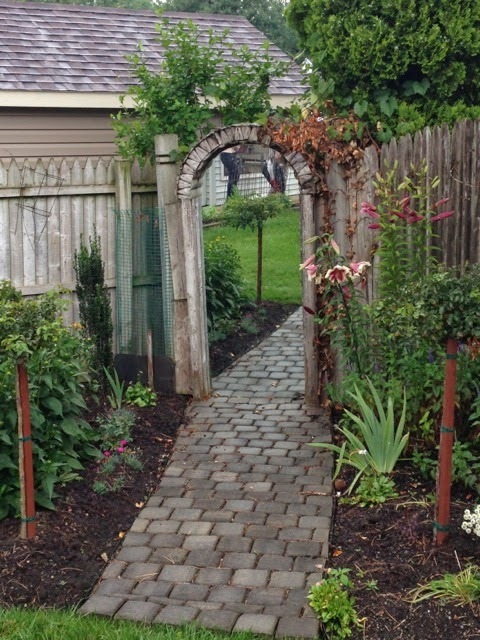 Peter is/was also the founder of The English Gardener, a well-known Buffalo area landscape design firm. 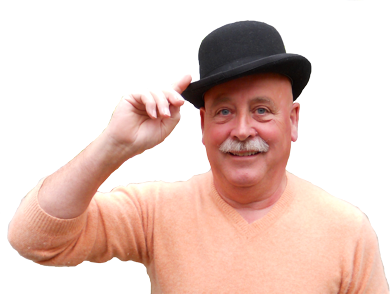 But he's also been a butcher, cabin boy, Naval officer, real estate salesperson, construction company owner, teacher, actor, chemical company owner, head hunter, convention planner, graphic artist, printing production manager, radio show host, and writer, among other things. He's retired from it all now, having mostly accomplished his goal of "...becoming an interesting old man." He does still do the occasional talk/lecture for groups. is one of the few abilities I have. It was a drizzly day for a garden tour so I had Peter for a bit almost by myself. He showed me around his garden. I knew it was someone whose interest in garden was more than a relaxing hobby. It's a lifestyle. 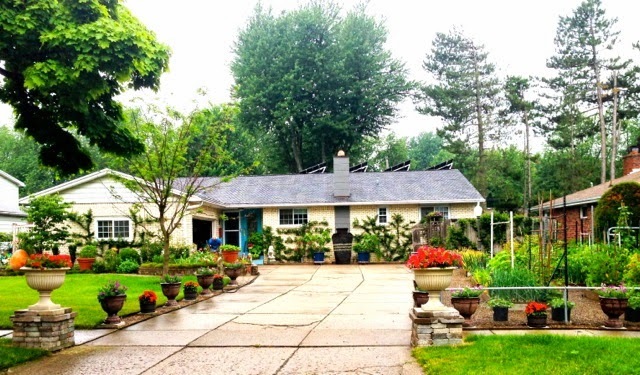 Half the front yard is an immaculate raised bed vegetable garden interspersed with his own sculptural pieces made from stacked slate, with espaliers, and potted annuals on stacked brick pedestals. The back was a winding-pathed gallery of unique plants, and unique use of plants, with art and ideas unlike any other garden I've ever been in. My kinda' garden. 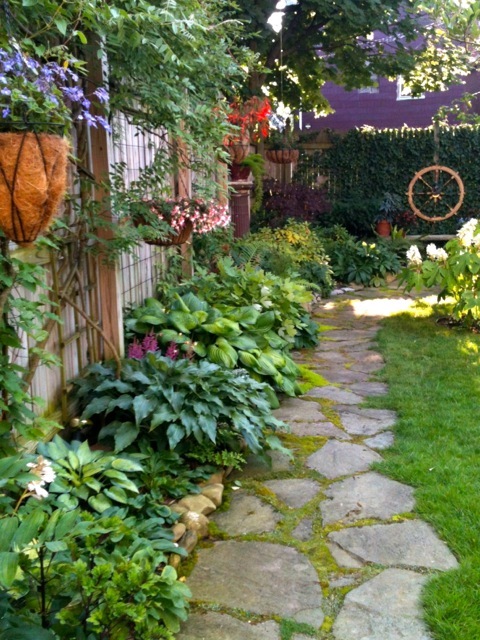 I like to think of my own garden as less an organized manicured garden and more a laboratory for garden design ideas. And that's what I saw in his – though his botanical experimentation, construction ability, and creative and artistic sense are well beyond my own. I could have stayed there for hours. 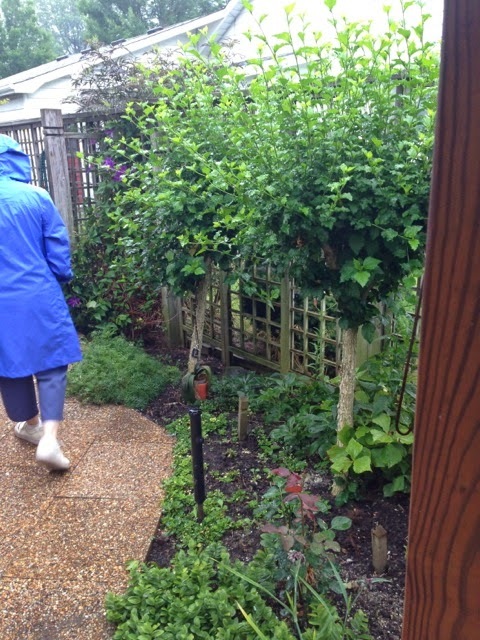 Here I'll show you some features of his garden and what I remembered of what he told me about each. 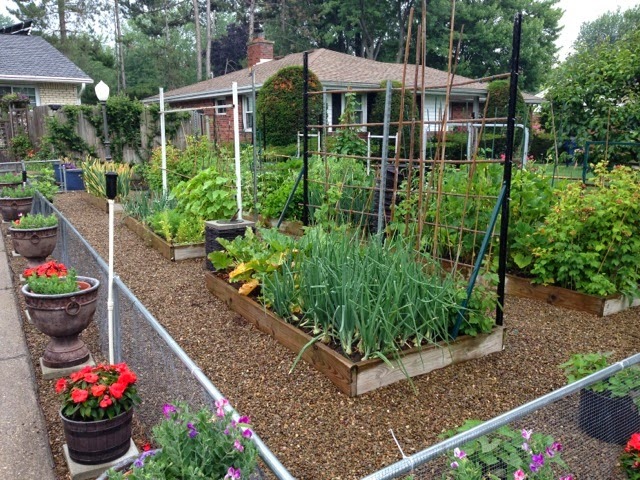 Neat gravel paths surround this "allotment-style" garden of simple wooden raised beds, with supports for climbing plants. He told me what his vegetable garden yield was in pounds, but it was crazy high and I don't remember what it was. 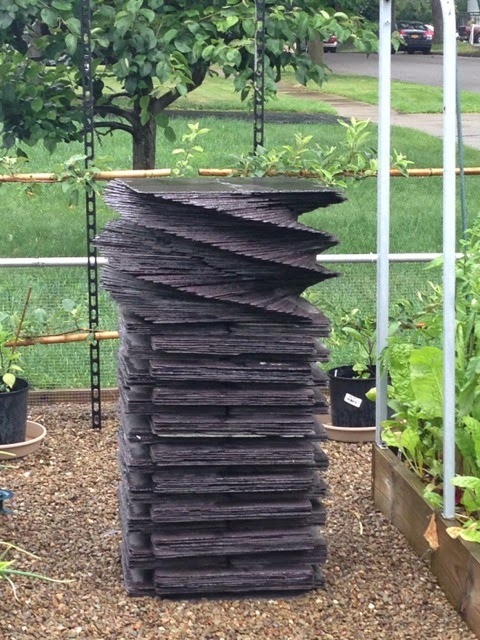 He created this (and other) stacked slate sculptures in and amongst the vegetables. Even vegetables like to be surrounded by art, I suppose. ...and a sundial. 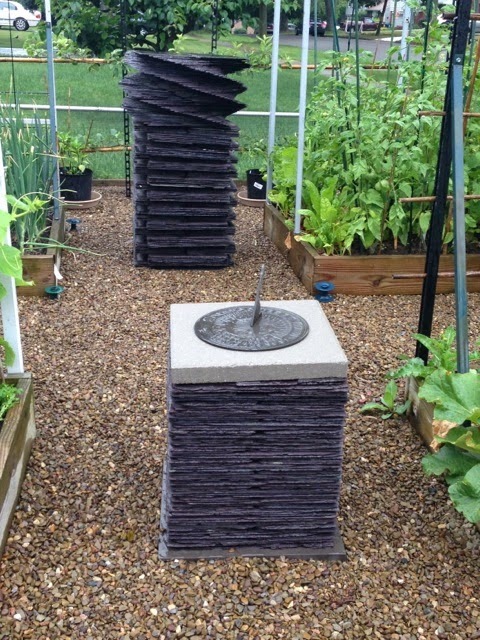 Vegetable gardens need sundials too. 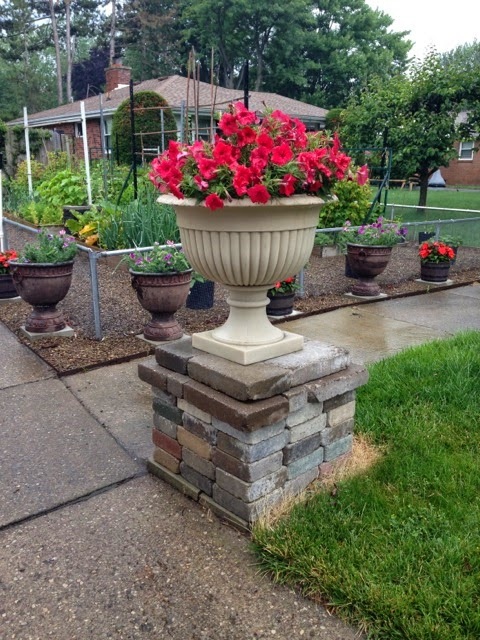 Looking back toward the street, outside the chain link fence, which actually gets barely noticed, is a row of annuals in planters on pedestals. Peter has many espaliers going. I cannot even remember what these were. I should have written notes, but felt that was a bit impolite while having a conversation. If I get back there, I'll do a more in-depth "interview." 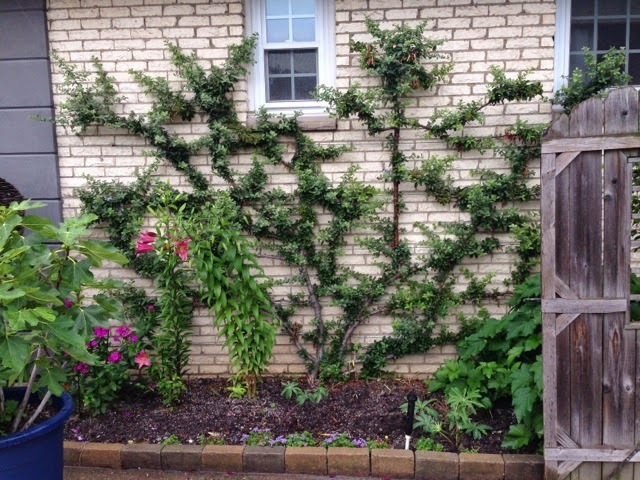 Another free-form espalier. These flanked both sides of the "vase" seen in the next photo. 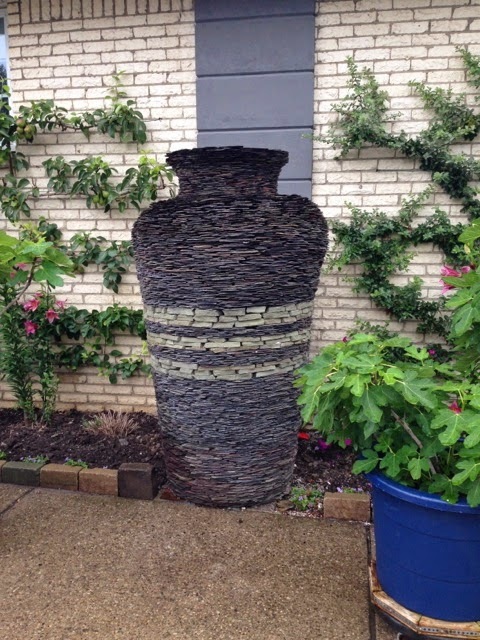 The focal point of the front of the house is this stacked slate "vase" made from the slate from an area church roof that was being thrown into a dumpster. After getting permission, he spent many an evening hauling slate from the work site to his house. 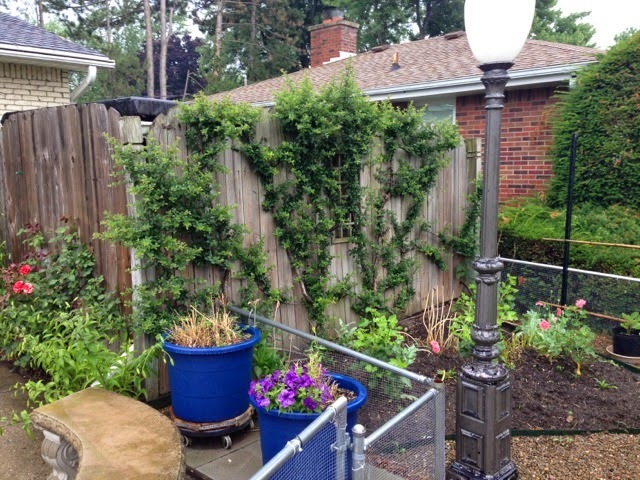 To separate "rooms" of the backyard, there were more dry-stacked pedestal with plants. 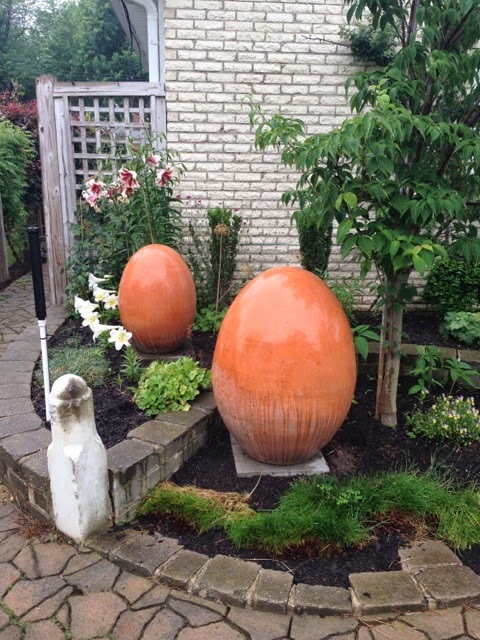 I love this idea and will find ways to incorporate them into my garden. One thing I remember he told me was that he "...hated corners." I didn't ask if it was a fear, phobia, or funny fickleness. 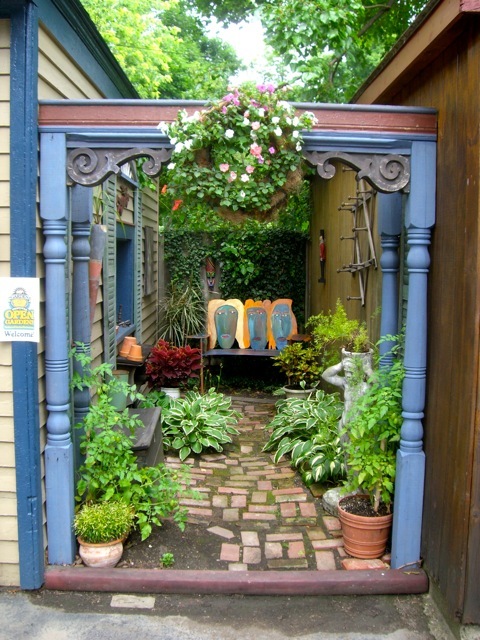 He placed this mirror in the corner of the yard, angled the top forward and tilted it slightly to get the effect of a continued path beyond his fence. Love this idea. 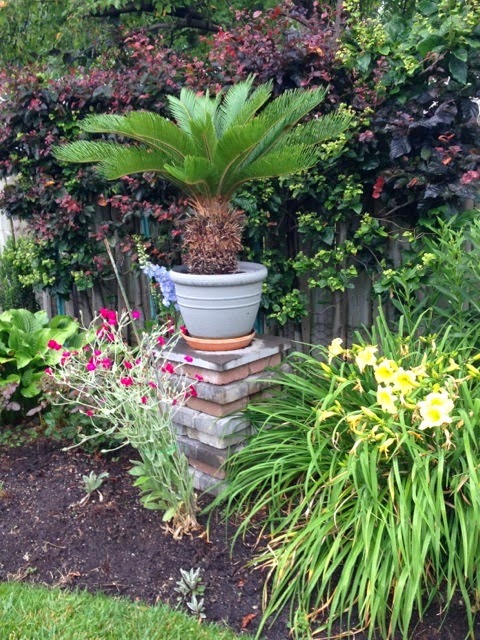 and to fill in a blank spot with one of his many tropicals. 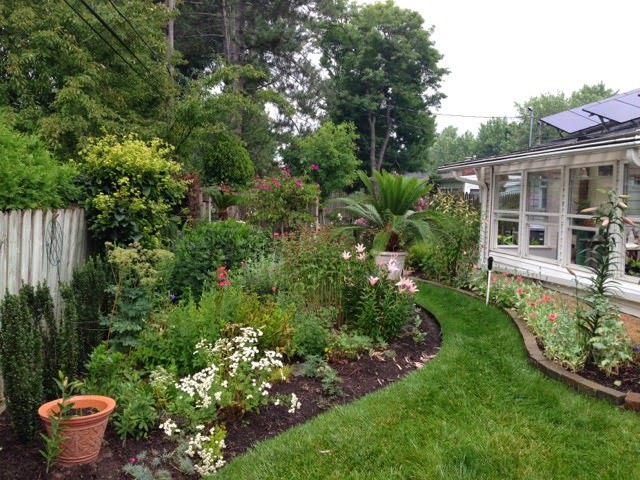 He's got a great mix of tropicals, perennials and annuals throughout the garden. Most of the reseeders he lets do what they want, until they do what he doesn't want. It's a very controlled chaos. It's not a successful garden if you can't sit out in it and enjoy it. 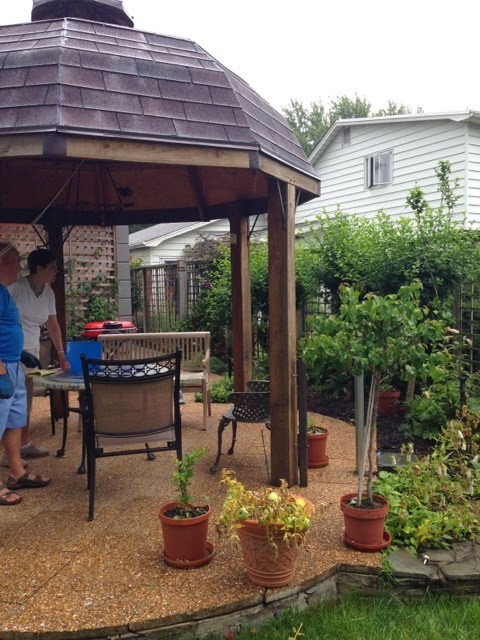 He built this octagonal pavilion for outdoor dining. The paths he's on is grass, lined on one side by brick and the other by corten steel strips keeping crisp edges between grass and garden. He went with grass paths here because beside it, on the other side of the narrow planting bed, there is already a gravel path, and he didn't want all gravel all the time. 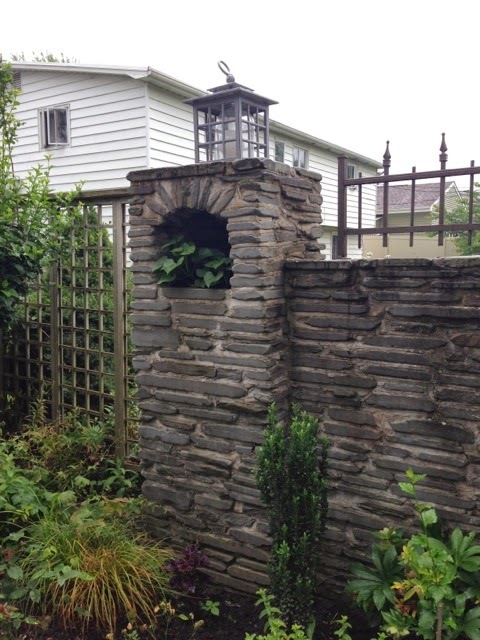 Having the unnatural aversion to corners led him to this stone wall solution for the corner of the property - with built-in planters top and bottom. No dry-stacking here. 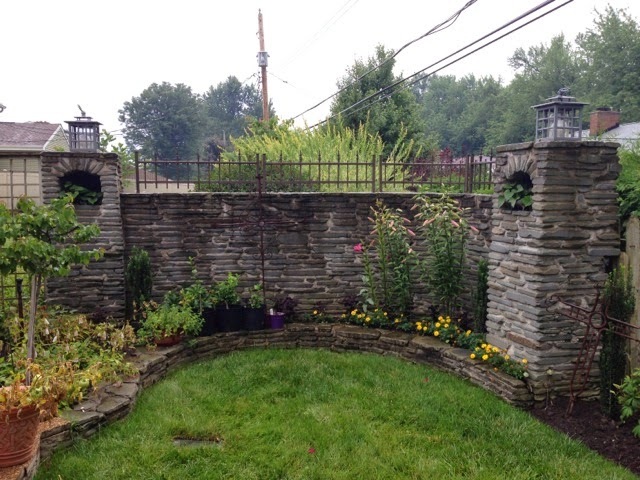 Lanterns and wrought iron finish off the curved stone wall. Looking back from whence we came. 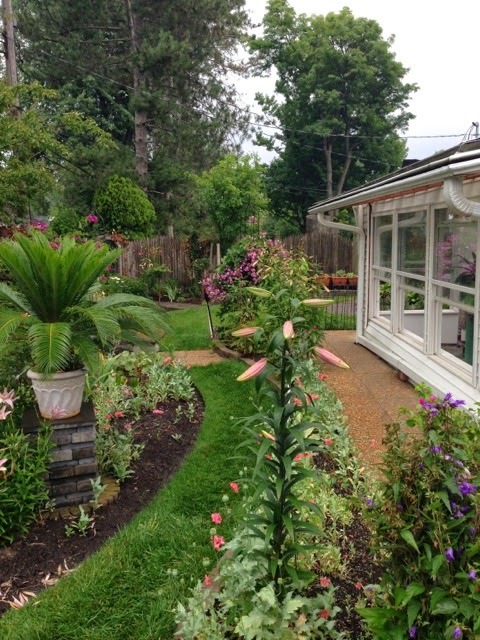 To the right you can see his greenhouse where he overwinters the tropicals. It has a koi pond in it to keep the moisture up for the plants. he's not a particular fan of "tall plant in back, short plants in the front" garden design. He likes the multi-layered natural feel of plants popping up where THEY think they'll grow well. Against the fence is a row of pollarded Rose of Sharon trees. He keeps them trimmed down, and all but strips them every Fall. 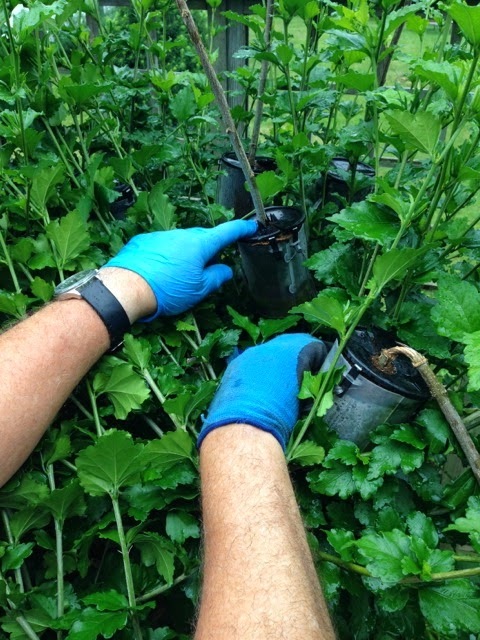 The result is small, manageable trees with great color, texture, and the perfect size for a small backyard. Here he is showing me the rooting cups he slipped over the young branches of the Rose of Sahron. With these he's effectively "air rooting" the branch. Inside the cup, the branch is forming roots, Once the roots fill the cup, he cuts the branch below the cup and ends up with a 3-4' tall rooted tree that is the genetic match to the tree he took it from. THIS is the solution I'm looking for to replace the dwarf pear tree that died on me this past winter. I can grow the identical type pear tree now, rather than getting another pear tree that does not match the existing ones. Eureka! Looking over the back yard, I see how effective NOT having a corner can be. With the mirror back there, it makes the garden seem larger. 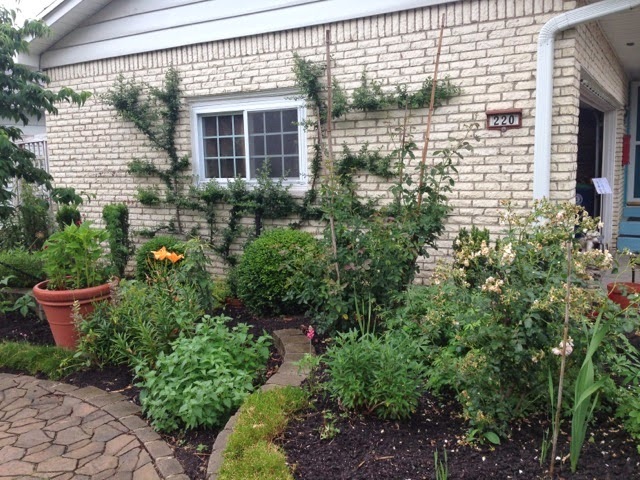 One last look at the pollarded Rose of Sharon. 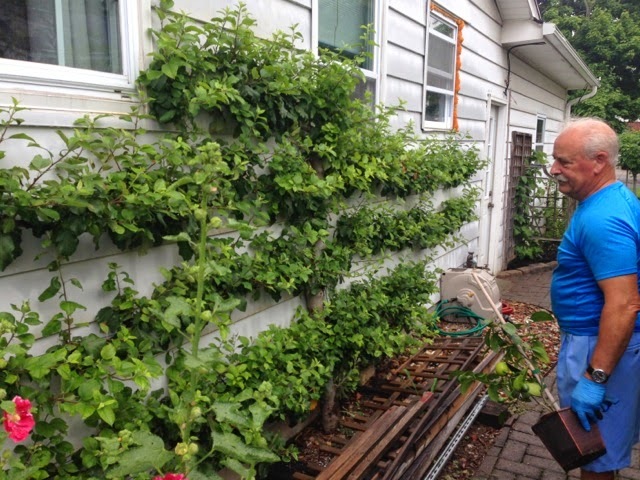 Peter admiring yet another espaliered tree on the side of the house. The trimmed hawthorn tree "hedge" opposite the espalier above. 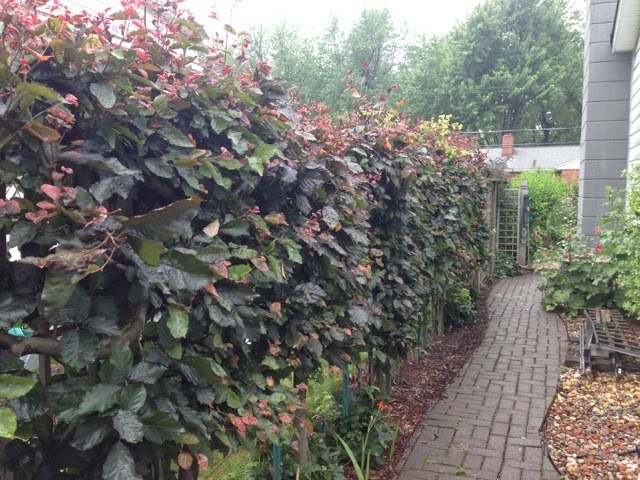 The extreme trimming makes it a privacy hedge of great texture and color that changes throughout the year. Certainly gives this narrow alley its personality. because I see many of my ideas in here (done better! ), as well as ideas I want to steal. Peter is my friend and neighbor and is an extremely interesting man - nothing old about this fella. He's taught me a ton about the garden. And, he makes a mean Mojito! With all he knows and can actually do - AND he makes a mean Mojito? I can learn from him. Really appreciate how he's used curves in the garden - I'm at the point of doing a redesign and thinking I might get rid of mine....perhaps not. 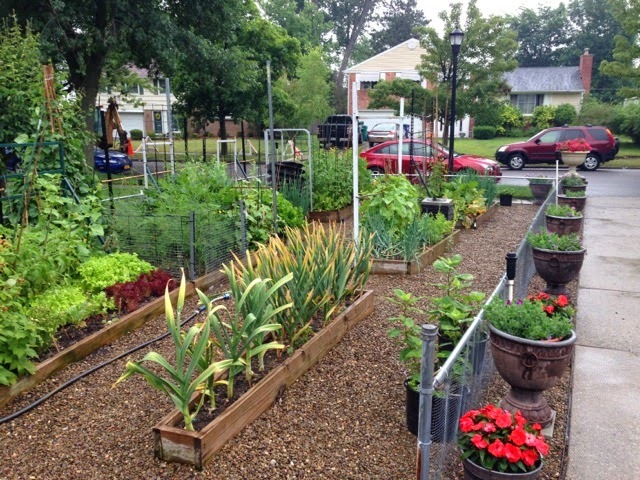 So many excellent things/horticultural projects to learn from. p.s. 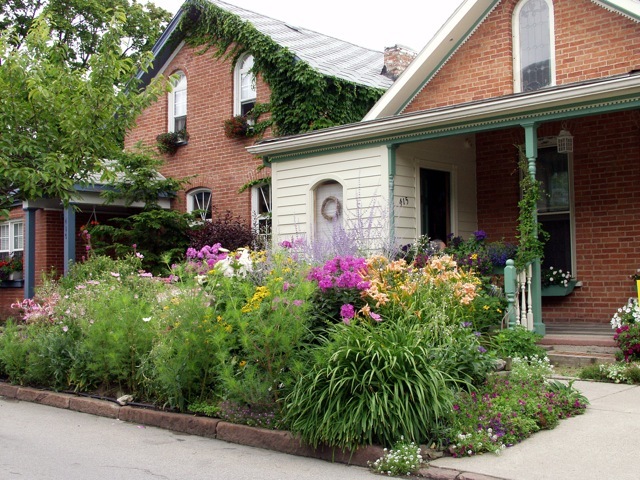 picked up C/AAA New York 2014 guide and there is nothing about the Garden Walk in Buffalo!!! Looks like events are called into the editor - maybe for next year? Thanks for the C/AAA catch. I'll be sure to get them a press release for next year. I don't have a lot of curves in my garden. I'm a right angle kinda guy. 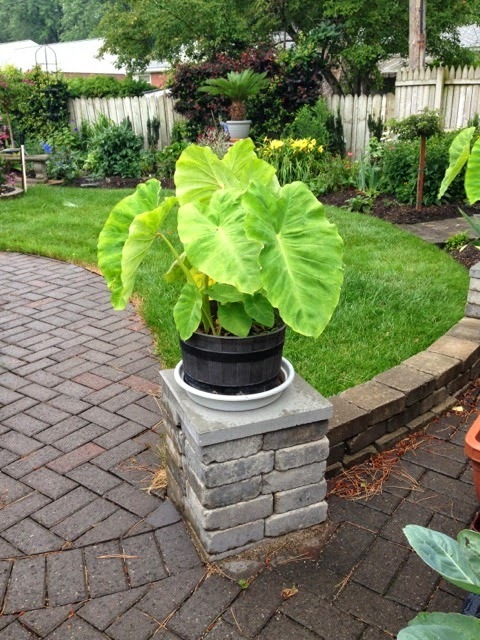 The slate vase is genius. There are no right angle corners is nature that I know of (but lots of 60-degrees.) How did you come across a tour of his garden? I'd known of Peter since the days when he left Buffalo - but I didn't know where he lived or even that he moved back. He had his home on the Snyder Clevehill Garden View tour of one of Buffalo's "inner" suburbs. A very nice community of older, beautiful, and stately grand homes. I went on the tour, saw his name on their map and HAD to see it. Beautiful post I like it very much you are telling regarding all critical issue to be thought in scheming and setting up of a landscape. For pond care Pond Liner Repair Kit is one must element for pond?